As this week of commemoration and celebration of the fiftieth anniversary of the March on Washington and Martin Luther King, Jr.’s “I Have a Dream” speech comes to a close, I’d like to share a book of poetry that gives voice to a little-known chapter in the history of segregation and discrimination against African-Americans in the United States. 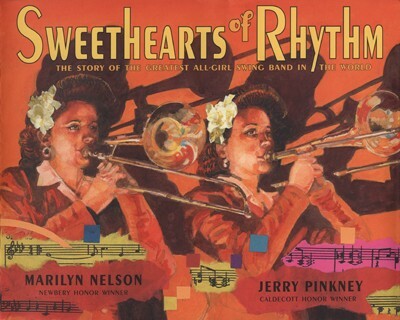 Sweethearts of Rhythm: The Story of the Greatest All-Girl Swing Band in the World, by Marilyn Nelson, is a completely original book. Nelson has created a mosaic of voices which, piece by piece, tells the story of “the first integrated all-women swing band in the world.” (Author’s Note) Rather than have each musician tell her story, Nelson lets the instruments talk. And do they have a tale to tell! Beginning with the band’s roots in the Piney Woods Country Life School, each poem shares details about the musicians and their music, as well as African-American life in the early 20th-century South. On the filament of a melody. It was ‘Chattanooga Choo-Choo,’ but it was a prayer for peace. But, in “Jump, Jump, Jump,” the alto sax reminds us that the reality of life is never far away for these musicians. Throughout the text, Jerry Pinkney’s amazing illustrations mix watercolors and collage to enhance the feeling of Nelson’s poems. Sepia tones are used to portray the desolation of the Dust Bowl, the indignity of segregated restrooms, and the injustice of Japanese internment camps. Warm, vibrant colors are used when children are jumping, couples are dancing, and victory is being celebrated. These lines could also describe Nelson’s crafting of these poems. Their “shimmering texture of sound” isn’t always shot through with joy, but it always contains the truth, a testament to the lives of these brave women and their instruments, who did bring joy to countless Americans despite the prejudices they faced. Please be sure to visit Tara at A Teaching Life for the Poetry Friday Roundup for more poetry. To say that I have been obsessed with writing lately would be an understatement. The curriculum work I wrote about last week has me very excited about our school year. As I’ve prepared for school over the past week, though, I realized I left out at least one critical element of writing instruction: time. In his 2008 book Outliers, Malcom Gladwell popularized the idea that it takes 10,000 hours of practice to become a master at any given task. Recently, some have questioned this notion, and Gladwell responded with a clarification on The Atlantic Wire by pointing out that this rule applies to “cognitively demanding activities that need significant thought.” Writing is certainly a cognitively demanding endeavor. For students to become even proficient writers, they need time every day to write. Students need ample time to generate ideas. They need time to play with language so they develop a richer vocabulary and deeper understanding of language structures. They need time to develop confidence and their writing voice. Time is a four letter word for most of us. We never have enough, are always running out of it. But time is exactly what our students need if they are to come anywhere close to mastery of writing. We will never make more time, but teachers are creative problem solvers. By closely examining long standing routines and our priorities, we can find more time in our schedule for this skill that is so critical to learning. At our meeting to kick off the year yesterday, all of the speakers shared a personal story about their experience in education. Our students have their own stories that they want to share. They deserve the opportunity to tell them. After all, caring about each others’ stories is what makes us human. Thank you, as always, to Stacey and Ruth at Two Writing Teachers for hosting the Slice of Life Challenge and providing a space for us to become better writers by telling our stories. Without trying to be thematic, I read three books this weekend that all related to taking better care of the Earth and all the creatures we share our planet with. 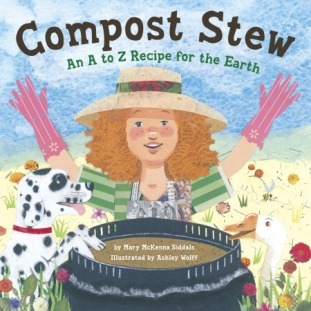 Compost Stew: An A to Z Recipe for the Earth by Mary McKenna Siddals (Tricycle Press, 2010; illustrated by Ashley Wolff) is a clever rhyming alphabet book that explains how and what to compost, as well as why composting is important. Ashley Wolff’s collage illustrations are a study in recycling themselves. The main character’s apron is made out of pages from the Farmer’s Almanac, beautiful papers are used for goose feathers, and found objects add depth to every page. Years ago, we made composting columns out of soda bottles so kids could observe this process. This was a great project, although some kids were grossed our by the worms! Now, I would add a writing component to this unit, using the experience to model writing a how-to book. Instructions for how to construct these columns can be found here: http://www.learner.org/courses/essential/life/bottlebio/ecocol/build.html Marty McGuire Digs Worms by Kate Messner (Scholastic Press, 2012; illustrated by Brian Floca) is a natural read aloud choice for a unit like this. Denise Fleming is a favorite of early-childhood teachers everywhere. 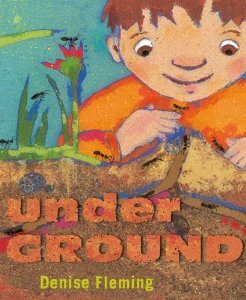 In underGround (Beach Lane Books, 2012), Fleming has created cut-away illustrations of the ground beneath our feet using pulp painting, “a papermaking technique using colored cotton fiber poured through hand-cut stencils.” (from a note included on copyright page) Animals, plants, rocks, and minerals are all shown with details sure to fascinate the youngest naturalists. Humorous touches are everywhere, making the book a kind of I-spy of buried treasures. Two pages of facts about the critters who inhabit the book supplement the simple rhyming text. 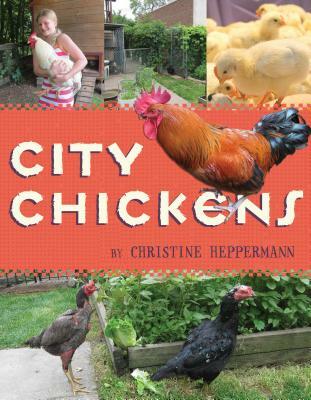 City Chickens (Houghton Mifflin Books for Children, 2012), by Christine Heppermann, is a non-fiction book for kids in second grade and up about Chicken Run Rescue, a shelter for rescued hens and roosters in Minneapolis. Heppermann includes a wealth of information about Mary and Bert Clouse’s efforts to care and find new homes for abandoned chickens. The reasons such a shelter is needed are explained, as is the responsibility of caring for these birds. You will have a different view of them after reading this book and seeing Heppermann’s gorgeous photographs. Notes include information for educators and a source list. This book could be used as a springboard for opinion writing about keeping chickens as pets. Teacher’s College Reading and Writing Project has a digital text set of additional resources on pets in the classroom here. More information about City Chickens is available on this website. I grew up across the street from a working dairy farm. The rhythms of the farm were the rhythms of life. It makes me sad to know so many children are only able to experience nature from a distance, but these books will ignite the curiosity of children about the wonders that surround them. Be sure to visit Jen at Teach Mentor Texts and Kellee at Unleashing Readers to find out what other people have been reading lately. Thanks, Jen and Kellee, for hosting! For the past six days, I’ve worked with an amazing group of teachers making revisions to our writing curriculum. The dedication and passion these men and women brought to this work made my job of facilitating much easier. I feel good about what we accomplished and know that these teachers all feel prepared to launch the writing workshop in their classrooms next week. We still have so much work to do, but thanks to the Units of Study developed by Lucy Calkins and her colleagues at the Teachers College Reading and Writing Project, we have a good grasp of the process and new expectations. Everyone is excited for school to start so we can begin working with students and help them become capable, confident writers. Teachers often ask me about the purpose of the writer’s notebook. They are uncomfortable with the idea of letting kids write about a self-selected topic. They want to know what they’re supposed to do with this writing. Do they grade it? Does it have to become a story or some other kind of a polished piece. I always explain that no, this writing is not graded. It doesn’t necessarily have to become something else. Because of these questions and the discomfort some of them have with writing itself, I began our work days by giving the teachers time to write. Some days I offered a photograph or piece of art; some days I shared one of Corbett Harrison’s Sacred Writing Time slides. It was interesting to watch how the teachers reacted to the prompts and how they worked. (I did write, also.) But the real revelations came when the teachers shared their writing. Everyone had approached the task from a different angle, an angle that was meaningful to them. Some were surprised by the direction their writing took. Others were grateful for the opportunity to sit quietly and be reflective after a hectic morning trying to get to school by eight o’clock. We talked about the importance of giving our students choices about their writing and about the importance of feeling comfortable enough to share our work. We all agreed that going through this process ourselves would help us as we guide our students in the weeks to come. The most valuable insight for me came from what I wrote this morning. Harrison’s slides always include whatever “National” day it is. Today happened to be National Radio Day. This made me remember a record album of old time radio programs that my mother used to listen to when I was little. Like links in a chain, this thought led to other ideas, which led me to an insight about a character in a story I’ve been writing this summer. This cascade of memories reminded me of one of my favorite scenes from Ratatouille, when Anton Ego takes his first bite of the dish Remy and Colette have lovingly prepared for him. Why wouldn’t we want our students to have this same kind of opportunity to see where their writing takes them? Who knows what they might discover about themselves? 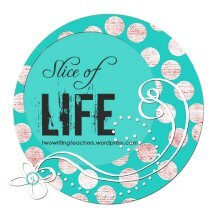 Thank you, as always, to Stacey and Ruth at Two Writing Teachers for hosting the Slice of Life Challenge. With the beginning of a new school year upon us, teachers around the country are making plans for a year that is sure to be filled with challenges. But right now, we aren’t thinking about those hurdles. We’re thinking about possibilities. Teachers are pros at seeing the possibilities and potential in children. We are tireless in our effort to find ways to bring out the very best in our students. One of the most important ways we do this is by sharing books that help our students see the possibilities and potential within themselves. Artist and writer Debbie Millman recently told graduates at San Jose State University that success has nothing to do with luck. Rather, “it is really all about the strength of IMAGINATION.” This is an important message for students of all ages. 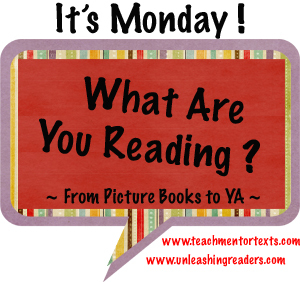 Last week I came across several picture books that can help our students understand the importance of keeping their imaginations open to the wonders and possibilities all around them. 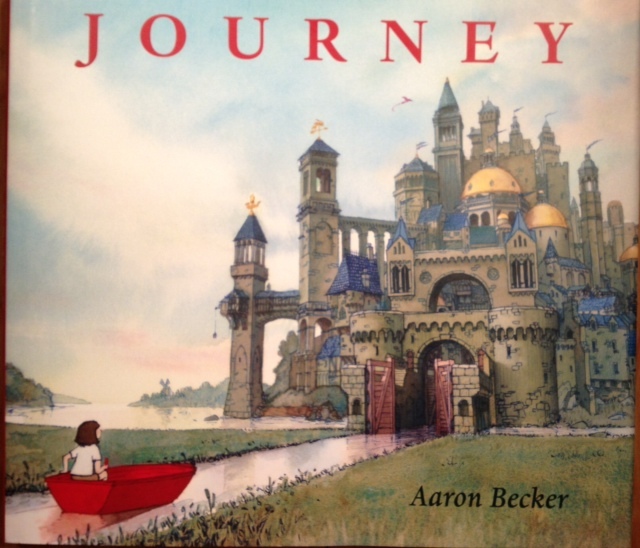 Journey (Candlewick Press, 2013) by Aaron Becker is a stunning book. It will remind readers of Harold and the Purple Crayon immediately, but Becker’s full color illustrations give this book a magical quality. There is an exotic mysteriousness to Journey that will lead to many questions and rich discussions about just exactly where the girl with the red crayon has gone. If you haven’t seen this book yet, the trailer will give you an idea of the riches within. 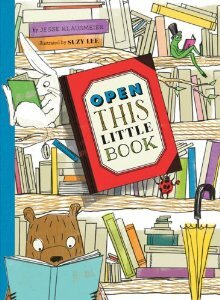 Jesse Klausmeier’s Open This Little Book (Chronicle Books, 2013; illustrated by Suzy Lee) is a book I would have adored when I was little. This is a book within a book within a book and so on. The story follows one pattern to the middle of the book, then follows another pattern to the next to the last page, when the pattern changes and readers are rewarded with Lee’s charming illustration depicting the endless possibilities in books. The cover of each little book hints at the animal featured within. This is just one of the clever details that will have young readers examining the illustrations over and over again. 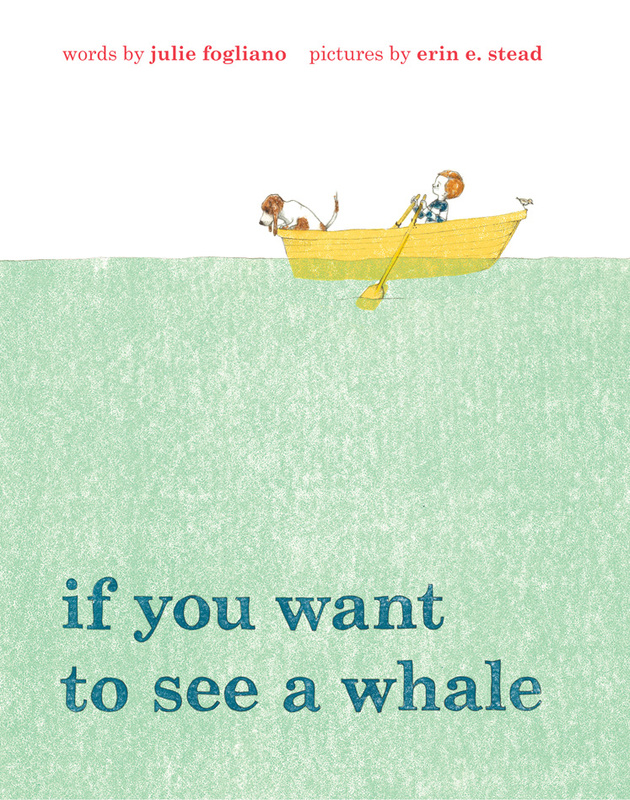 If you want to see a whale (A Neal Porter Book, Roaring Book Press, 2013; illustrated by Erin E. Stead) by Julie Fogliano is a lovely, quiet book. According to Fogliano, in order to see a whale, “you will need…time for waiting and time for looking and time for wondering…” This is an important reminder to children (and their parents!) in today’s busy world. Yesterday, Donalyn Miller asked readers of the Nerdy Book Club blog what books they were looking forward to sharing with students this year. These are three titles I will be sharing with children again and again to encourage them to unleash the power of their imaginations. 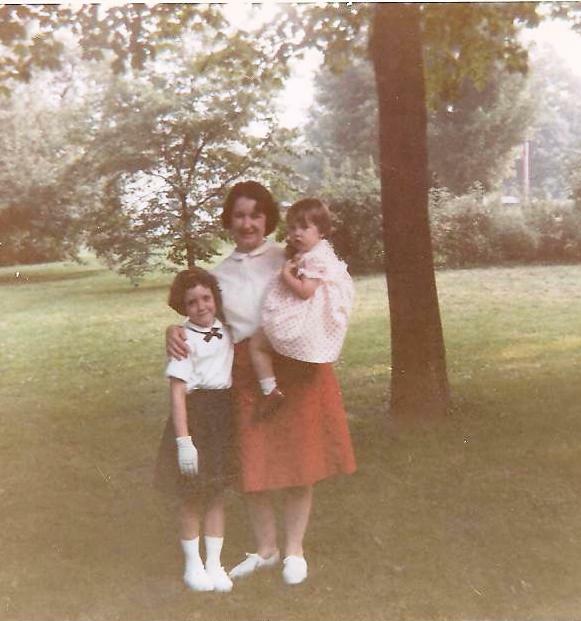 With my mother and sister before I marched in the parade for the first time. Every August, my town is transformed by the Bridgewater Country Fair. Sponsored by the volunteer fire department, this annual event was one of the highlights of my childhood. 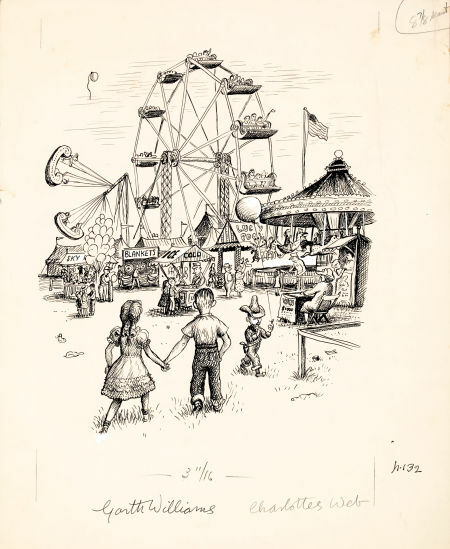 The fair was a magical place with a merry-go-round and Ferris wheel, farm animals, flowers, and vegetables. All summer, I looked forward to eating all the food I could only get at the fair. The fair where Wilbur and Charlotte have their final triumph has always reminded me of our fair. As a matter of fact, I think one of the reasons I loved Charlotte’s Web so much the first time I read it was because White’s description of the fair resonated so deeply with me. (I still love it, but for many other reasons.) I’ve often tried to write something about the Bridgewater Fair, but have never been happy with the results. So this year, inspired by Margaret, I decided to create a found poem using White’s own words. Drawn from chapters XVI, XVII, XVIII, and chapter XIX, this poem uses White’s language to capture my memories of the fair of my childhood. The Fair only comes once a year. round and round in the sky. Spin a wheel, win a doll. Thank you to Lisa at Steps and Staircases for hosting the Poetry Friday Round Up today. Be sure to head over and read more wonderful poetry! School doesn’t officially begin until August 26th, but today I worked with first grade teachers on revisions to our writing curriculum. We had honest conversations about their concerns, productive conversations about our expectations, and began laying out their first unit. We were all pleased with what we accomplished and hope to get even more done tomorrow. We also looked at several books, considering them as possible mentor texts. We all loved the book included in with the TCRWP Units of Study, Night of the Veggie Monster, by George McClements, and they wished they had Ralph Tells a Story, by Abby Hanlon last year. Everyone felt that we should choose at least one more book before school starts. I mentioned I was pretty sure I had a book at home that would fit the bill. When I got home this evening, I went into my office and started looking through the stack of picture books where I thought the missing book was. I didn’t find it, but I did uncover this, buried for so long I didn’t even know I had it. 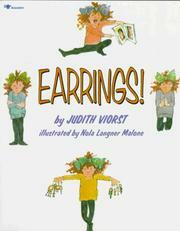 Barbara featured this book on her Picture Book 10 for 10 post on Saturday. I even commented that I didn’t know the book! So thank you, Barbara, for highlighting this wonderful book, so that I would know what a treasure I had found. Who knows what else is hiding in that pile?